Those who read this blog regularly will recognise a theme… Yes, another Middle Eastern dish, this time from Morocco. I do love sweet with savoury and this dish is perfect in that regard, provided you get the balance right. Therefore, make sure you taste it at the end and add the right amount of salt and pepper. The secret to this dish, and many like it, is not to rush the cooking. Cook the chopped onions slowly so they melt into the sauce; and gradually reduce the sauce at the end until it is rich and caramelised and the baby onions are lovely and soft. I always do my couscous the same way: re-hydrate it in chicken stock and then toss in toasted slivered almonds and pomegranate seeds. When pomegranates are not in season, I use frozen seeds. Make yours however you like. This recipe is from Arabesque, by Claudia Roden. It will, easily, serve four. Blanch the small onions in boiling water for 5 minutes, drain and, when cool enough to handle, peel and trim the root ends. Sauté, in a pan or casserole large enough to hold the chicken pieces in one layer, the chopped onion in a little oil until softened. As I have said many times before, don’t rush this stage. I, usually, add a little water to the pan and put the lid on and let it cook for, at least, 20 minutes. I then take the lid off and wait until all the water has evaporated. Stir in the saffron, ginger and cinnamon. Put the chicken pieces in the pan and season with salt and pepper. Brown them lightly all over. Return the chopped onion to the pan and add the pickling onions. Add about 1 cup of water and cook, covered, over a low heat for about 40 minutes. When the chicken is cooked, remove it from the pan and set aside. Even though the recipe did not suggest to, I also removed the pickling onions. I then poured the sauce (through a strainer) into a heat proof jug. I separated the fat from the sauce and then returned the sauce, chopped onion and pickling onions to the pan. If your sauce is not oily, there is no need for this step. It’s just that I am a bit neurotic about fat. Stir the honey into the pan. Check the seasoning. You need quite a bit to mitigate the sweetness. Taste it to make sure it is just right. Cook, uncovered, until all the water has evaporated and the onions are brown, caramelised and soft. Return the chicken pieces to the pan, spoon the onions on top of them, cover and gently heat through. Whilst the chicken is heating, cut a pear into wedges (don’t peel it). Melt some unsalted butter and a little bit of oil in a small pan and sauté the pear pieces until they are soft and lightly coloured. Serve the chicken and baby onions with couscous and pear and sprinkled with some toasted slivered almonds or sesame seeds. This entry was posted in Chicken & Duck, What's for dinner? 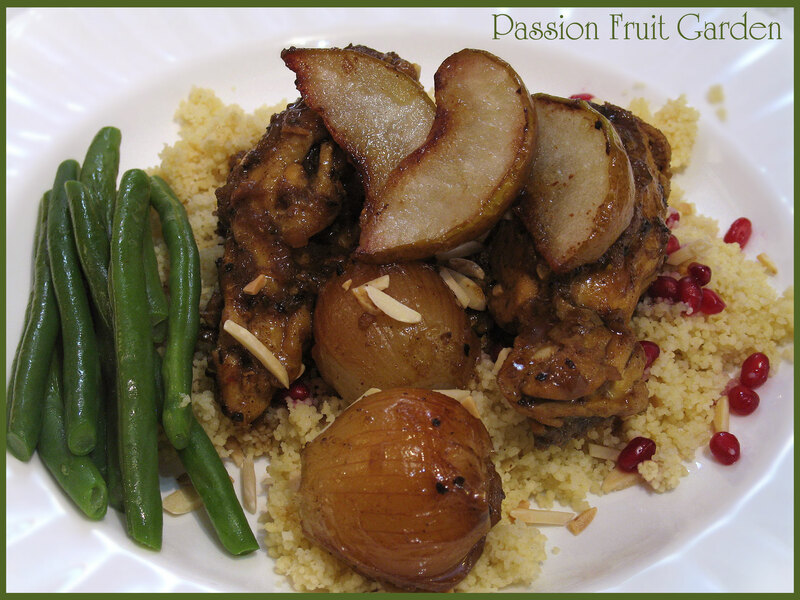 and tagged Arabesque, Claudia Roden, Moroccan chicken with caramalised onions by Glenda. Bookmark the permalink. This is a beauty of a meal. I love the caramelized onions in there and the pears sound like a really nice addition. That ginger-saffron-cinnamon combination sounds great…guess I’ll have to take out a loan and restock my saffron (is it unbelievably expensive over there as it is here?). The last time I bought some there were just a few strands in this tiny plastic bag in a small box and when the fellow at the check out rang it up, he did a double take and said “what the heck is this stuff, gold?”. He was going to do a price check on it because he thought it had been mismarked. Hi Diane, Saffron is pretty expensive here too. I believe it is because it is so labour intensive to pick. Oh well we have to have our indulgences don’t we? BTW How was the party? I need to do a blog on the party soon (still putting the house back together) but we all had a great time. I’m glad we got the canopy although putting it up is a story all on its own) because it started raining just after the food and champagne toast. I think if I were to do it over again, I wouldn’t let my daughter talk me into making chicken picatta for 50. Oh, that does look good, doesn’t it! But, much to my shame, I can’t grow bulbing onions in my garden – just one of those localized things! However, I grow tons of green onions and leeks – so, with your permission, I shall do a bit of adaption and use baby leeks instead – how bad could it be? Hi Doc, so good to hear from you. You are as wicked as always. I am in love with this recipe. I bought a huge beautiful free-range chicken at the Real Food Festival today and I’m trying to decide how to honour it with a wonderful recipe. I think this is one way! You won’t be sorry Maureen. I love your Persian style food. Your onions in particular look absolutely magical, caramalised, soft and creamy.. Yum!